Today Stuart got on the boat and said 'Its going to be an easy day for you today, there is only going to be 3 of us". I informed them that there was going to be nothing easy about today. The way the fish have been biting we need to have a minimum of 4 anglers on the boat just to keep up with the action. I told them they are going to work there butts off trying to keep up with the fish. We set up over a couple of fish so they could get their act together then I put them on a big school. They realized real quick what I was referring to earlier. We took 15 hits in about 3 minutes and after they confused everything in the boat we had to take a quick break and review how to do everything again. Each time they deployed lines and reeled in fish they got better and better. It eventually got to the point where I would locate a school of fish and within a minute they could get 8 rods in the water before they would hook up. When they go again they will be dialed in and ready for action. 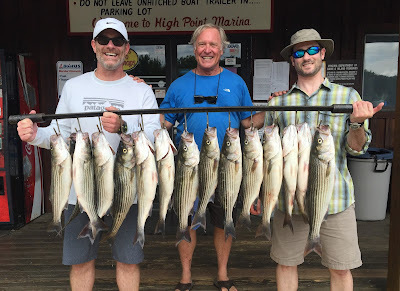 This morning we caught over 50 Stripers and they got to take home plenty of fish for the freezers.